NEW TANTUM ROSA INTIMO QUOTIDIANO COMFORT SPRAY SPOT: RELIEF IS ROSE COLOURED WITH ARMANDO TESTA. The new spot for TANTUM ROSA from the Angelini Group, created by the Armando Testa Agency is on air. 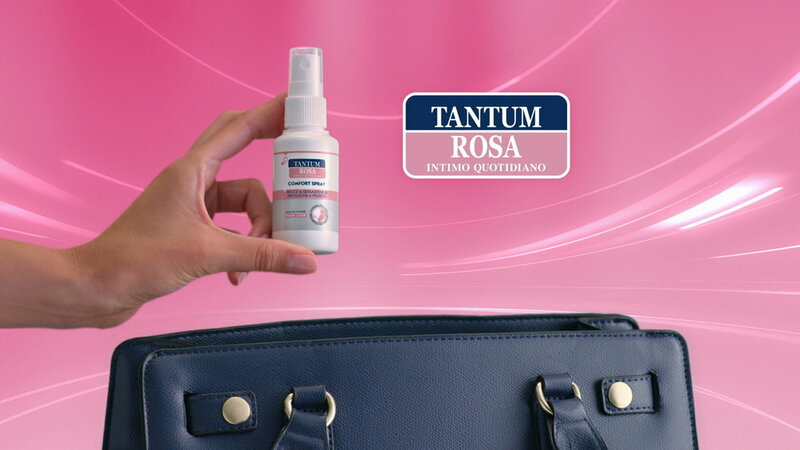 The ad stands out because of its rose coloured background and it invites viewers to always carry Tantum Rosa Intimo Quotidiano Comfort Spray in your bag to relieve that burning and itching sensation women might experience when they are out of home. In fact we see a woman’s hand as she pulls the spray out of her blue coloured bag, along with the pink background this brings to mind the colours of the logo. The demo highlights how practical it is to use: thanks to the “Upside Down” technology, it also works upside down with a speedy refreshing action. With a morphing effect the demo passes to the real life of the protagonist who calmly and with a smile continues her shopping with her friend. The final pack shot reminds us that with Tantum Rosa Intimo Quotidiano, Comfort Spray or its Crema Serum, relief is rose coloured. With creative direction from Piero Reinerio, art director Monica Barbalonga and copywriter Mariarosa Galleano worked on this project. Production Company: Little Bull from the Armando Testa Group.